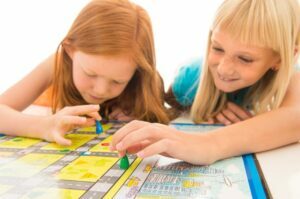 When I began to work through my TESOL course, I learned that while games should be enjoyable, the purpose of playing games in the ESL classroom is to reinforce specific linguistic elements. Putting theory into practice, I taught an intermediate communicative lesson on asking and answering questions about habits and routines using WH questions. After the lesson, I introduced a board game which was a giant square made up of 36 small squares, each containing the beginning of a WH question such as “How often…” or “When do you…”. The board had a start square and a finish square and required a token to record the team’s progress. I handed out one paper copy of the game board for each pair of students and divided the class into two teams. One pair of students on one team rolled the dye first, and then moved their token to the correct space on the board. One member of the pair had to first tell the rest of their teammates how many squares to move, then the other had 10 seconds to ask the opposing team a WH question based on the half question within the square. If they exceeded the limit they moved back one square (I kept the time). The other team had 15 seconds to answer the question and move forward one square, or fail and go back one square. It took time for the rules to sink in, but soon the students were enthusiastically asking and answering, and racing to the final square! Having followed a proper lesson plan, the ESL game allowed students to practice their speaking skills and acquire the language point.